We do this painting project every year during the run-up to Halloween. I refer to it as making spider webs. Every now and then an adult will pull off something that looks like a spider web, but making spider webs is hardly the point. We start with foil pie pans (the same ones we've been using for over a decade), line the bottoms with circles of black construction paper (made by using the same tagboard template I made my first year teaching), then set out bowls of white paint, spoons, and marbles (all of which pre-date my tenure at Woodland Park). The idea is to use your spoon to put your paint-covered marble in your pan, then to roll the marble around in the pan by tipping and tapping it. And even while it isn't a very good way to make spider webs, it's a good paint-based project for mess-averse kids, as well as a way to experiment with gravity, circles, and cause-and-effect. Most of the kids in our 3-5's and 5's classes give it a go before making it their own in the classic manner of figuring out "what else" we can do -- painting with the spoons, adding extra marbles, working with friends -- but even then it's a somewhat limited activity which means the station is usually completely dead by the end of 30 minutes as the kids have exhausted it's potential for more open-ended pastures. 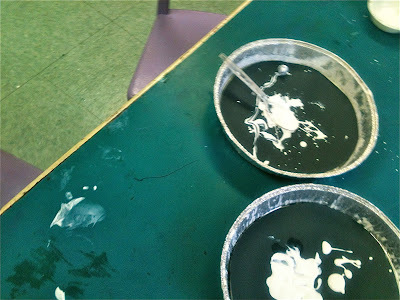 Ah, but the younger children in our Pre-3 class don't usually even try for one second to make a spider web: finding pans, paper, paint, spoons, and marbles and, in an even more classic manner, turn it all immediately into a version of finger painting. There are always a handful of two-year-olds who turn every project involving paint into this most open-ended art project of all. This is why, when we're indoors, I like to have water in the sensory table, which is positioned only a few feet away. The late, great Tom Hunter had a simple honest song called "Build it Up and Knock it Down," which in many ways could be the theme song for every Pre-3 class I've ever taught. In this case the lyrics might go, "Paint it on and wash it off and paint it on again/Wash it off and paint it on and wash it off again." This kind of cyclical, repetitive play -- turning it on and turning it off, handing it over and taking it back, climbing on and jumping off -- is one of the foundational ways we learn. We do these things over and over until we've convinced our scientific minds that, indeed, we have proof for our theories. As the children circled back and forth between the art and sensory tables, some were finished after only a few circuits, moving on to other things. 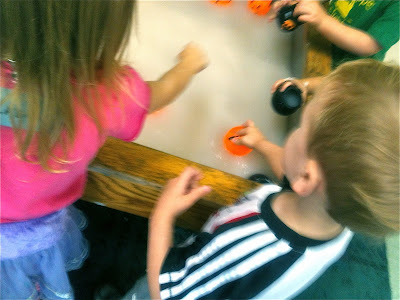 Some became fascinated with the "ghost water" or "milk" we were creating in the sensory table. Others went beyond their fingers, to painting their palms, to creating white, elbow length gloves of pigment, before washing it off again. Dutifully, we save those disks of black construction paper that are salvageable, draping them over our wire drying racks, preserving them as "decorations" for our upcoming all-school Halloween party. 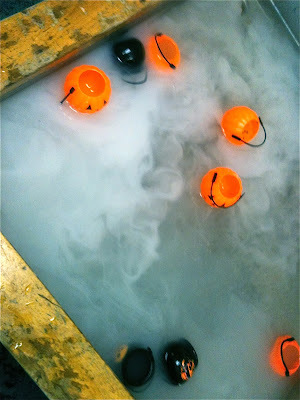 They'll hang on the wall with the jack-o-lanterns, ghosts and other artwork we created for the event. And if asked by their dad to talk about the blob of white paint on black paper, they'll shrug and say, "It's a spiderweb," then if they're feeling particularly talkative, they'll go into a discussion of ghost milk, the science of which will go right over daddy's head.